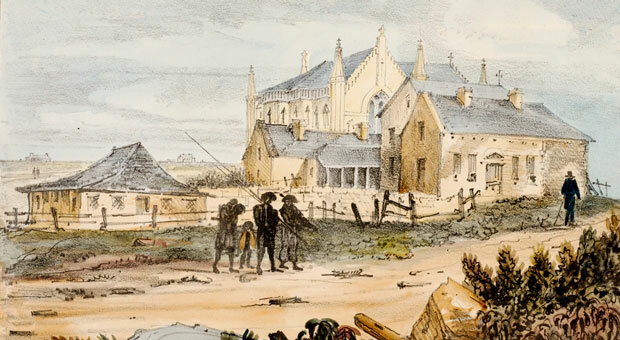 When Australia’s first two Catholic priests arrived in Sydney in 1820, many Aboriginal people around Sydney had already been exposed to the ideas of the Christian religion. One of the priests, Father John Joseph Therry, quickly got to know Aboriginal people around the Sydney region. At this time there was no Catholic church in the colony and work did not commence on the first St Mary’s Cathedral until October 1821, so priests like Therry travelled widely to visit the faithful and to seek out converts. 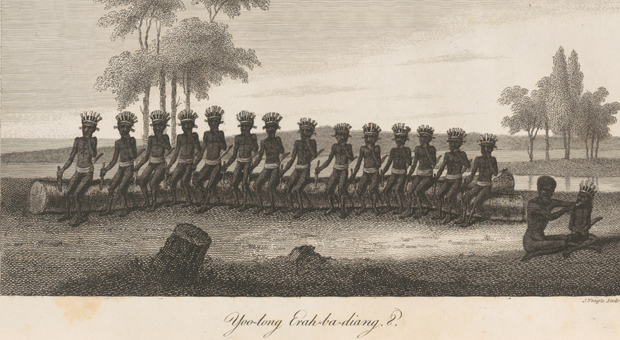 Therry attended Aboriginal ceremonial gatherings and baptised as many children as he could. The earliest record of these baptisms was probably at one such gathering in January 1821, when Therry baptised five children from Liverpool along the Georges River. 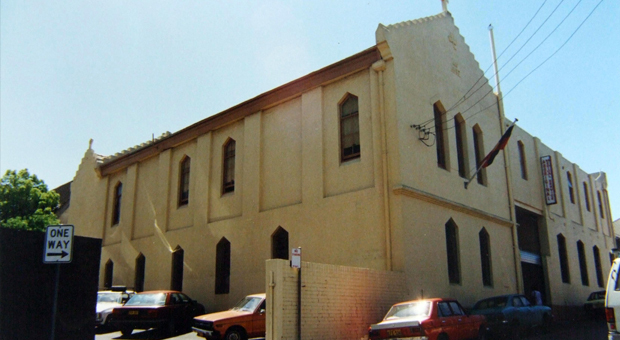 What Aboriginal people made of these baptisms is not recorded, but after St Mary’s Church was opened in the early 1830s, Aboriginal people came there in order for Therry or other priests to baptise their children. At this time there were Aboriginal settlements down the hill from the church in The Domain and at Woolloomooloo. It is likely their residents walked into town past the church, as several drawings and paintings from the time suggest. 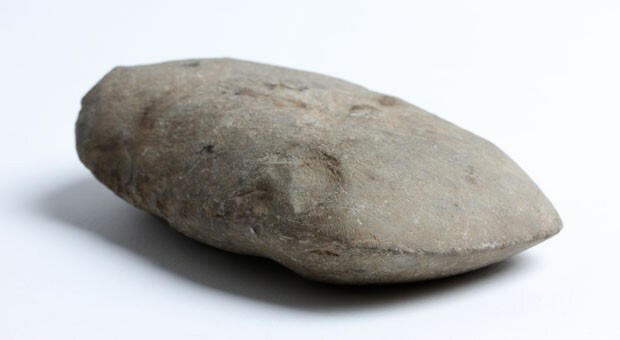 Archival records show that several dozen Aboriginal children were baptised throughout the 1820s to the early 1830s. They came from groups living near the church at Sydney, as well as from Parramatta, the North Shore, Broken Bay, Liverpool and as far south as Wollongong and the Shoalhaven. Sometimes several families would attend St Mary’s to baptise a number of children. 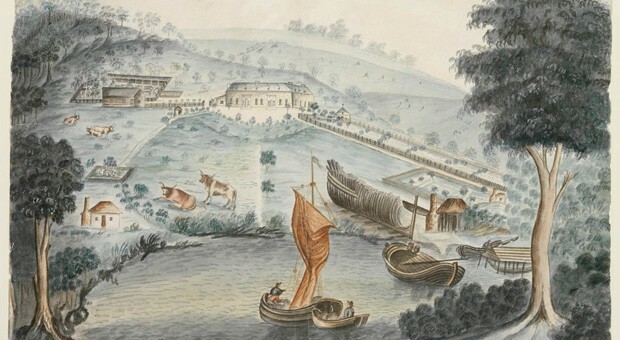 In some cases, records of these baptisms are the only time that particular Aboriginal people are mentioned in historical documents, but they show that there were more Aboriginal people living around Sydney than those named in annual distributions of government blankets. 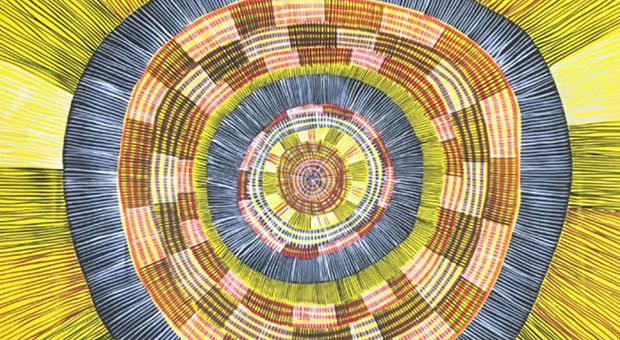 Others are better documented, such as early colonial Aboriginal identity Bungaree’s son, Bowen Bungaree, whose son and daughter were baptised at St Mary’s in 1830 and 1832. Another was a so-called chief of the Sydney tribe, Thomas Tamara, and his wife Nanny, whose daughter Gertrude was baptised in 1827. Senior Liverpool man, Cooman, had a number of children baptised at St Mary’s over a 15-year period. His son Francis was the last known Aboriginal baptism at St Mary’s in 1836. The burial of Sydney man Jack Harris (1810s-1863) in the Roman Catholic section of the Devonshire Street Cemetery also suggests that he was baptised at St Mary’s. 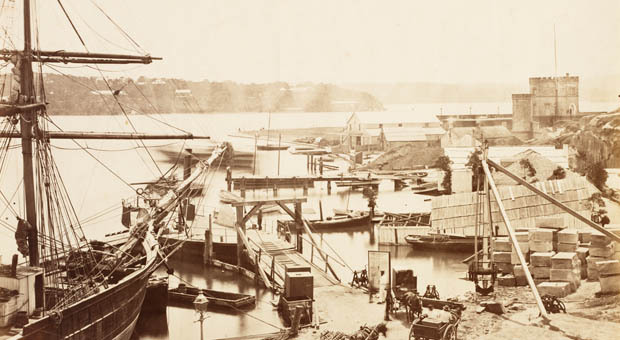 After the 1830s there was very little church involvement in Aboriginal affairs around Sydney until the late 1870s, when missionary Daniel Matthews began visiting Sydney to raise funds for the Maloga Aboriginal mission he had established a few years before along the Murray River. On a visit to Sydney in 1881, Matthews persuaded 23 Aboriginal people living around Sydney to accompany him back to the Maloga Mission. He may have found that some of them were already familiar with the Christian religion through their earlier experiences with the Catholic Church.